Come next year, Carnival customers who sail from Jacksonville and Tampa are each going to have an additional itinerary to choose from when the line begins to offer new 7-day eastern Caribbean itinerary options approximately once a month. Details appeared in the complete Cruise News Daily article on June 25, 2010. Alaskan governor Sean Parnell signed the bill yesterday which reduces the state's head tax. If the state would pass the reduction, the cruise industry earlier agreed to drop their lawsuit against the state which was seeking to have the tax struck down entirely. There are two key reductions included in the bill. One reduces the tax charged on each passenger ticket from $46.00 to $36.50. The other credits passengers for head taxes charged by Alaskan ports, such as Juneau and Ketchikan, which do not share in the state tax. Since most itineraries call at both those ports, for most people it will mean a further $15 reduction. The reductions will become effective on November 1, 2010. Parnell supported the tax cut, which the cruise lines wanted, saying that since 2009 when cruise lines began to reduce capacity, there was a sharp decrease in the state's visitors, in both 2009 and 2010. He said the state lost more than 260,000 visitors, $420 million in direct and indirect spending, and up to 5,000 jobs. For this reason, the cruise lines wanted the reduction in the tax. In any business, including tourism, you have to appease the customer, and the cruise lines are the state's customers. They are the ones who decide how many ships come to Alaska and ultimately, therefore, how many visitors can cruise to Alaska. But still, the state may be setting themselves up for a disappointment. From comments in the media, it seems the governor and citizens are expecting berths taken out of the market to be restored. Deployment schedules are already set for 2011, so it's too late to see any restoration next year, but 2012 deployments are now being finalized, and they seem to be anticipating more ships then. The cruise lines only agreed to drop their lawsuit against the state in return for the head tax reduction. There were never any promises made with regard to capacity. There are many more issues to be addressed in Alaska to make the industry as profitable there as they are elsewhere. As noted in Carnival Corp's earnings call this week, with the reduction in capacity, the pricing of their cruises to Alaska is much stronger, which is what the lines want. If they were to add capacity, it would probably only serve to weaken the pricing again. Alaska, therefore, may not get more visitors out of the deal, which is what they were hoping for. The cruise lines may, however, show their gratitude for the tax cut in a less measurable way - by not cutting capacity further in 2012. This article appeared in the June 25, 2010, edition of Cruise News Daily. CND subscribers also read about a medevac from Norwegian Pearl in Alaska yesterday ... Crystal Serenity achieving a perfect score on its annual Lloyd's Register audit, a standard much more important in the industry than the more familiar CDC rating ... changes to Carnival's air/sea program ... and RCCL's CDF brand serving Brazilian customers instead of French this winter. Details of these items appeared in the "Other Things You'll Want to Know" column in the June 25, 2010, edition of Cruise News Daily. The three Royal Caribbean brands in North America (Royal Caribbean International, Celebrity and Azamara) recently introduced Choice Air for their air/sea passengers, but effective July 1, the program will offer two additional options, and the standard air/sea program (where you don't know your exact flights until close to departure) will then shortly be discontinued. When the change is completed, the brands' air/sea programs will have changed completely. Details appeared in the June 24, 2010, edition of Cruise News Daily. Cruise ship art auctions have been making headlines recently when a major lawsuit was brought against one of the largest auction firms in the business after customers began complaining that the artworks they purchased were fakes. That firm was recently booted off one major cruise line. So how can you be sure artwork you purchase aboard a cruise ship by a "name" artist is genuine? How about if you have the artist there to vouch for it personally? On some upcoming Princess cruises, you can do just that. The complete article appeared in the June 24, 2010 edition of Cruise News Daily. A 71-year-old Pennsylvania man has been indicted by a federal grand jury on charges stemming from an incident aboard Royal Caribbean's Liberty of the Seas last December in which he is alleged to have touched a 6-year-old boy inappropriately in the whirlpool. The complete story appeared in the June 24, 2010, edition of Cruise News Daily. Carnival Cruise Lines' announced today that they will homeport Carnival Magic at Galveston when it arrives in the US in the fall of 2011. That will unleash a flood of capacity increases as ships move in conjunction with the Magic deployment decision. Both Galveston and New Orleans will see significant capacity increases as a result as Carnival moves to solidify their market position in both cities faced with competitors' recently-announced redeployments for roughly the same time periods. The end result will have Carnival Magic sailing from Galveston on 7-night cruises, Carnival Triumph in Galveston for a 4- and 5-night program, Carnival Conquest in New Orleans for 7-night cruises, and Carnival Ecstasy sailing 4- and 5-night cruises from New Orleans. In this CND article we looked at the details of the new programs, the changes that Carnival is requiring at Galveston and what it's going to cost, and the capacity that's pouring into New Orleans and what that might mean. The complete article appeared in the June 23, 2010, edition of Cruise News Daily. CND subscribers also read about Norwegian Epic being repaired and sailing from Southampton ... Crystal Cruises' expansion of their Visions enrichment program ... Carnival Glory scoring perfectly ... and good news for Jamaica and its visitors. Details of these items appeared in the "Other Things You'll Want to Know" column in the June 23, 2010, edition of Cruise News Daily. In 2012 Cunard is celebrating the 90th anniversary of the World Voyage, which they pioneered, and to commemorate it, the line is again sending out two of their ships on World Voyages - their flagship and their newest vessel. Details appeared in the complete article in the June 22, 2010, edition of Cruise News Daily. Last week, Princess Cruises decided their cruises scheduled for the rest of 2010 and early 2011 in Asia will no longer turn around at Bangkok (Laem Chabang), and opted to move the turns to Singapore instead. Affected are Diamond Princess and Ocean Princess sailings November 2010 through April 2011. Princess is reimbursing passengers for fees involved in changing their connecting travel arrangements. Details were in the complete article which appeared in the June 22, 2010, edition of Cruise News Daily. 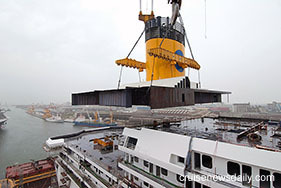 CND subscribers also read about Costa's fifteenth ship taking shape, with the funnel being put in place on Costa Favolosa. Photos are on the CND website ... Crystal expanding online capabilities for passengers with bookings ... and Norwegian Epic left the yard with 200 yard workers and subcontractors aboard. Completion work will continue on the ship at least until it leaves Southampton and possibly during its transatlantic crossing, although most of the work is out of the sight of passengers. Details of the above items appeared in the "Other Things You'll Want to Know" Column in the June 22, 2010, edition of Cruise News Daily. Technical problems are delaying Norwegian Epic's overnight cruise from Rotterdam to Southampton for its preview cruise there. The problem seems to be more serious than the statements would have you believe which simply refer to it as a technical problem. NCL confirms that the fault is with one of the propeller shafts. The severity of the problem seems to be shown in the revised schedule necessary to get repairs completed before Thursday's transatlantic crossing. The line is under pressure to have the ship in New York on time for its high-profile christening (July 2) and hosting of Macy's July 4 fireworks. The complete article appeared in the June 21, 2010, edition of Cruise News Daily. Last week CND told readers how port cities often forget that just because a cruise line operates from their city now, it doesn't mean they always will. Unlike hotels or other land-based businesses, cruise ships are very portable assets of the industry. Today the city of Rockland, Maine, is providing a classic illustration of how that forgetfulness works. The city is just beginning to have large ships call at the port and is deciding they want to limit the number. Instead of just issuing permits which would limit the number, they have decided to drastically increase head taxes and other fees somehow thinking this will discourage new ships from calling but forgetting that the lines which are now calling there won't be any too thrilled either. As we point out in the article, Alaska residents didn't think cruise lines would take ships out of their state as the result of new taxes and fees, and they now are famously wrong. Fincantieri Powers up Queen Elizabeth, Costa Celebrates La Dolce Vita and Were Crooks Branching out? CND subscribers also read about Fincantieri powering up Queen Elizabeth for the first time and her engines now powering the ship rather than it being powered by the yard ... Costa Cruises celebrating the 50th anniversary of the release of the Federico Fellini film "La Dolce Vita" aboard Costa Atlantica. ... and at least one sheriff about 75 miles away from South Florida is now wondering if a burglary ring was responsible for any break-ins in his country. The group, CND reported last week, is alleged to have gained access to Royal Caribbean's International passenger records to know when potential targets would be away from home. Details of these articles appeared in the "Other Things You'll Want to Know" column in the June 21, 2010, edition of Cruise News Daily.